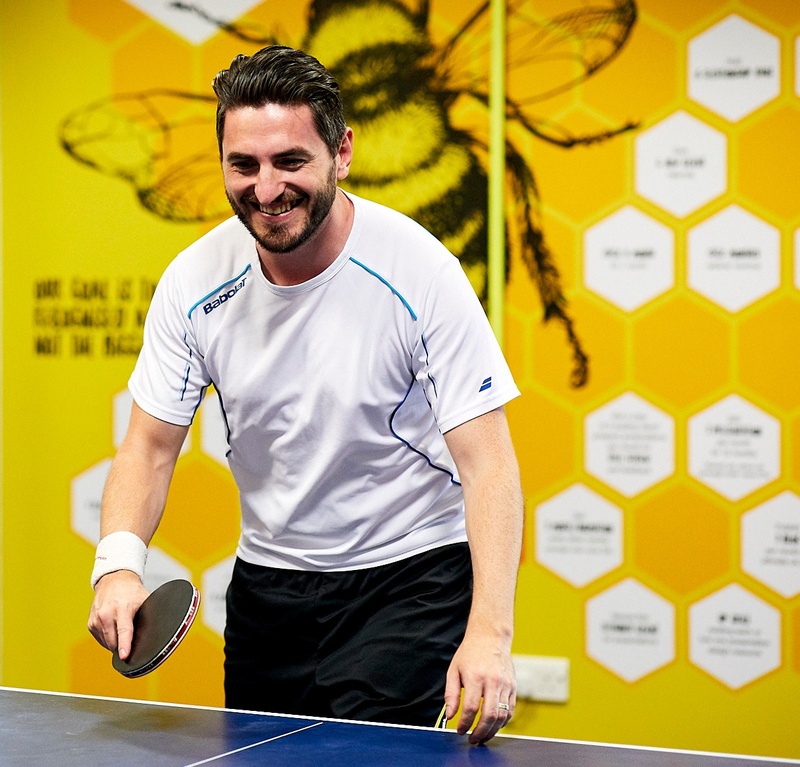 We’re not pollen your leg, Ultimate has seen great results from our ‘Hive’ as our buzzy team are far more motivated and we can visibly see the rewards of their progress filling up the Ultimate honey pot! Ultimate wanted to adopt an employee rewards schemes to boost engagement amongst our team, but give the whole concept a fun and creative twist. In April this year we decided to create the ‘Hive’, replacing our previous ‘Rewardopus’ of 2017, which featured an octopus with tentacles representing our different teams within the business. The whole Ultimate team loved the concept of ‘the Hive’ as just like the humble bumble bee, Ultimate strive to be the best, not the biggest. As a team, we identified with the bee. Despite being small creatures bees are amazing insects and excel at working together in harmony as a team towards a common goal. Bees often fly back to the hive and show their friends where the best nectar source is by doing a ‘waggle dance’. Bees work collaboratively just like the Ultimate team, as we always help each other to grow, pointing each other in the right direction to achieve our goals. The Hive perfectly reflects the hardworking ethos of Ultimate, as we are a busy hardworking bunch (the bees!) and our offices are a hive of buzz and activity, day in and day out. We are all incredibly passionate about what we do and our bustling team creating amazing work (the honey) and reflects the rewards (honeypot) at the end. The honey in our hive sustains us for future and exciting projects, fuelling our drive and creativity just as a honeycomb keeps buzzy bees going during winter giving them much-needed energy. Furthermore, the hexagonal shape of the honeycomb symbolises our six departments (Sales, Digital Marketing, Web Development, Design, Account Management and Presentations) all working together as one in a dynamic workplace. The goals were chosen with the business in mind, selecting objectives that would have the most positive impact and the rewards were created to best incentivise our very buzzy team members. Once the concept was decided on, our Design team worked together to create ‘the Hive’, making sure that it made a statement graphically and grabs people’s attention as they pass by. 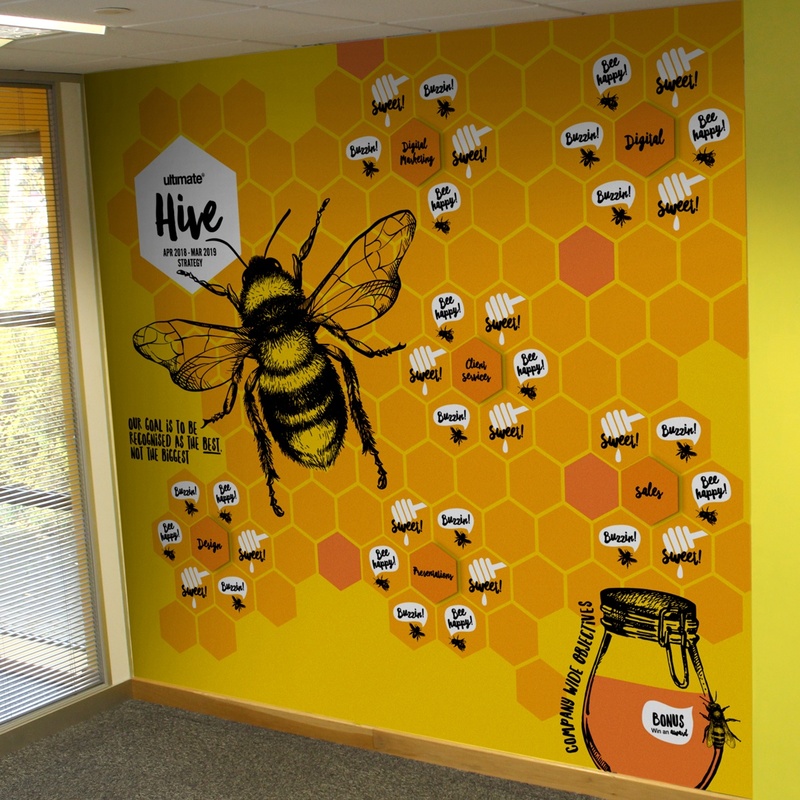 Ultimate wanted to make the ‘Hive’ space on our office wall interactive, so the design team created stickers to attach to the goals once completed, meaning that the individual teams and entire company can visualize their progress as they watch the hive fill up with honey (or rewards). These stickers include motivational, punny phrases such as ‘Hive Five!’, ‘Buzzin’, ‘Sweet!’ and ‘Bee Happy!’ that keep the team excited throughout the year about hitting goals. The stickers also work to create a real buzz when goals are achieved or are close to being completed, meaning we celebrate each success together and can keep up the momentum for the future. 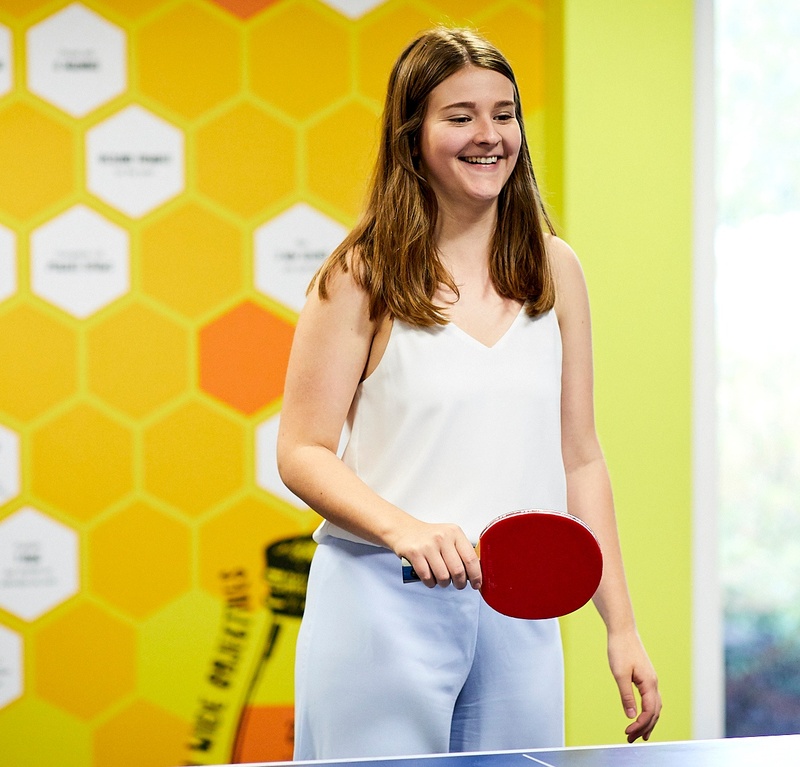 We hope our unique ‘Hive’ rewards scheme has left you inspired and demonstrates how Ultimate not only like to engage our team in exciting new ways, but take a creative and fresh approach to any opportunity.